Well, sort of. 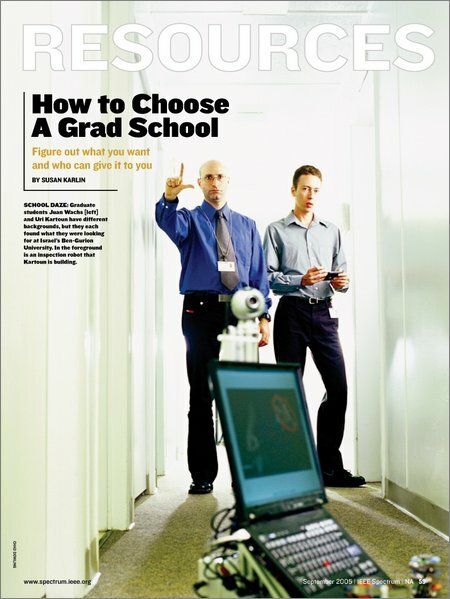 IEEE Spectrum's September issue has an article on choosing grad schools [PDF version] with a nice photo featuring an ER1. Uri Kartoun is developing robots, nicknamed EDNex and Clango, for handling suspicious packages. Down the hall, classmate Juan Wachs is working on a computer interface that responds to hand gestures. I understand there's a slightly less "sort of" mention of the ER1 coming up. Gotta say the machine would be easier on the back if it were simpler to drive remotely.